10/25/2010 – "Israel destroys Iran – on the chess board". This was the gleeful headline of countless news reports. Last year Iranian GM Morteza Mahjoob had played against 500 opponents with a 88.4% score. 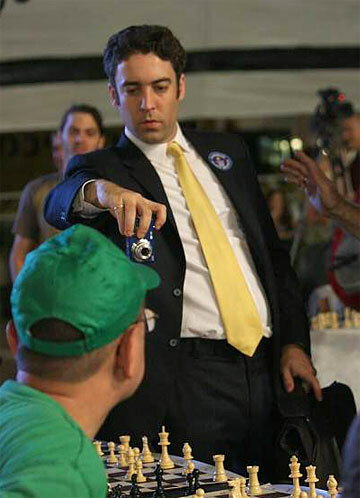 Now Gershon hast topped that by taking on 523 opponents with a 86% result, and got his name into the Guinness World Records book. We bring you a big pictorial report and videos. 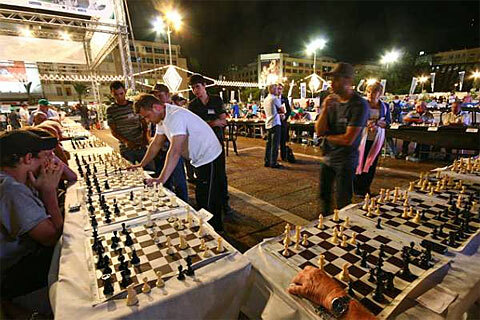 The Guinness record for simultaneous chess was shattered last Thursday in Tel Aviv when GM Alik Gershon challenged a huge field of 523 players in Rabin square at the very heart of the city. The magnificent exhibition lasted 18 hours and 30 minutes after which 454 wins, 58 draws and just 11 losses (86% in total) secured the required 80% norm to make it the new official Guinness record by the representatives of the international prestigious establishment who attended and controlled the event. His remarkable achievement is an improvement on the former record of the Iranian GM Morteza Mahjoob who played last summer in Teheran against 500 opponents. Gershon (30), twice world junior champion at the time and once Israeli champion trained for more than two months in order to be fit for the long journey around the square in the never ending 30°+ highly humid summer of Tel Aviv. It should be stressed that he had never had the slightest doubt that he would eventually get into the Guinness Book “either as the record breaker or as the first person to drop dead while giving a simul…” he said in an interview just before the start. The level was quite high with representation of virtually all ages: The youngest was 5, and the oldest 84, who held on until the last hour. No less than 300 out of the 523 opponents to start the great show last Thursday at 11.30 AM were students of the Shevach-Mofet Chess Academy, directed by GM Boris Alterman who also acted, together with the renowned organizer Rami Tal as the director of the entire event. 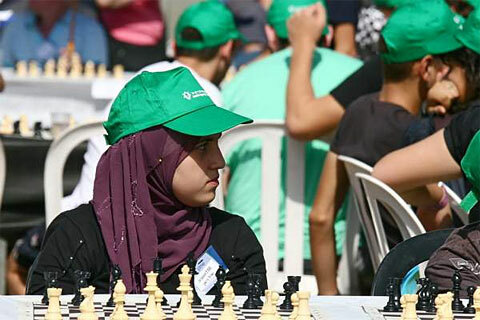 Amongst the other participants were also Israeli Arab chess players (from the chess school in the town of Tira) as well as Palestinian enthusiasts from nearby East Jerusalem. A special bus brought in a large group of former Russian veteran players who proved a hard nut to crack. Jonathan Amir (15) was the first chess academy student to beat the challenger and cash in the promised studies scholarship of 10,000 Shekels (approx. 2,000 Euros). His school mate, 13 years old Darya Tzubulski, was the last survivor on Friday at 6.00 a.m.! What now? was the exhausted Alik asked by Arie Golan, a leading radio interviewer right after the great show: “I am going to break another record” he was quoted replying in all morning news editions “ the Guinness record for…sleeping! – It was, in fact, a much more difficult effort than I imagined, and I realized it when actually saw the 523 boards for the first time. Even now, after some seven hours of sleep, I woke up to eat something, and I am going back to catch some more rest, I am still pretty tired”. What were the most difficult moments of the session? I had two breaking moments, both psychological, rather than physical. The first came after around eight and a half hours of play, when although the score was about 190 to 1, all the remaining games were against tough opponents and in complicated positions. At some point there I lost the pace of the simul, started spending lots of time at each board, and making mistakes. I believe around that time, although the games' number was cut in half, the time consumption per round was at peak, at around 50 min/round (we started with ~30 min per circle). However, after a timeout, and a few very useful pieces of advice from Boris Alterman (who by the way, was of an immeasurable help throughout the preparations and the event itself), and got back on track, resigning difficult positions, spending less time per round and eventually getting the pace back to around 30min, and less. The second shaky point was around the 13th hour, when I needed to score approx. 80 more wins (out of 180 or so games), but had only about 40 positions with clear superiority and about as many where I was clearly in a bad shape. Here again, a timely beak helped seal the deal: I regained composure ("seeing" the finish line was clearly of huge energy booster at this point), quickly finished the clear wins, resigned/drew some more of the difficult positions, and after 16 hours I officially reached the needed 420 wins. So much for the mental process. How did you manage physically? Physically, although very exhausting, I felt quite well – although judging by the concerned looks of the family and organizers I must've not looked that well. Now the legs hurt a bit, but that was never really a big issue during the game. How do you feel now about the entire affair? The feeling is, of course, amazing – although don't really have enough energy to feel much yet. The event being so widely politicized and covered by the press of course added a great deal to an already huge challenge. 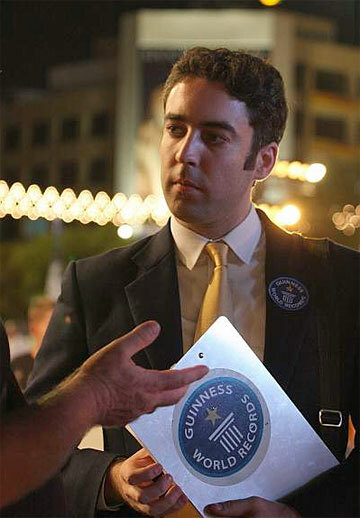 The organization was really fantastic, which was duly noted by the Guinness representative. Here I must really note the incredible effort made by my sister, Ilona, who was there for the entire time, basically walking the same distance as myself, and taking care of whatever I needed most of the time even before I would realize it myself. For me she's set the record for the most amazing sister, really! The Guinness official was indeed impressed by the organization as well as the accompanying cultural events. Elsewhere in the square the public could enjoy the performance of opera singers in an improvised café. Another simul was given to a group of celebrities by WGM (IM) Sofi Polgar and by the man behind the event, the chairman of the Jewish agency Nathan Sharansky. A former minister, he is a decent player of master candidate level. As a famous dissident in the Soviet Union he spent years in isolation imprisonment and managed to keep sanity by analyzing chess positions blindfold. 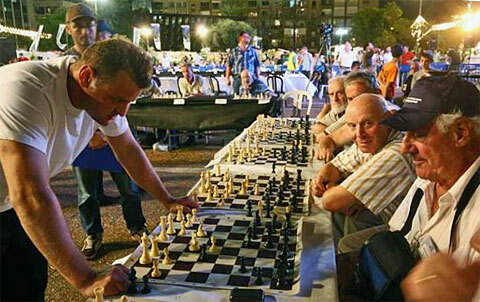 This special event, an idea and initiative of the Israeli Chess Federation (led by chairman Aviv Bushinsky and general manager Yigal Lothan) was organized with the cooperation of the Tel Aviv municipality to celebrate 20 years of blessed Aliya (Jewish immigration to Israel) from the former Soviet Union, and its contribution in all domains of life. Chess is obviously no exception. It remains to be seen who will be next to challenge the fresh record and how soon it is going to happen. 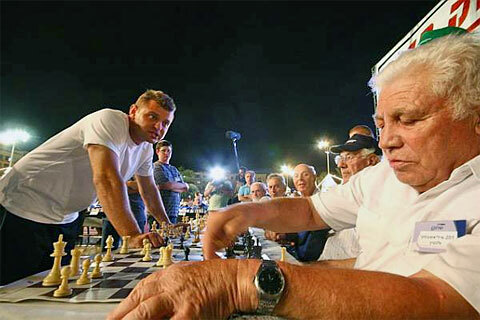 Meanwhile the world of chess in Israel has enjoyed an unprecedented attention of the local media, much more than earned it both formidable silver and bronze medals in the last two Olympiads. 15.10.2010 – Next Thursday (October 21st) the Guinness record for simultaneous display will be challenged once again in the heart of the city of Tel-Aviv. 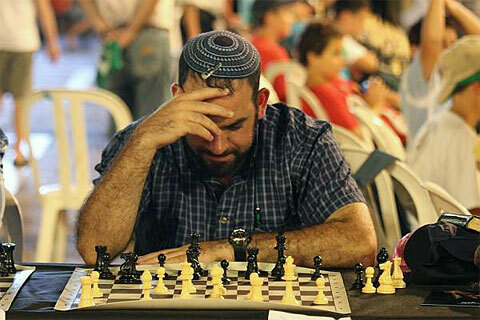 GM Alik Gershon is going to face more than 500 opponents in Rabin Square, next to the town hall of the Israeli cultural capital, trying to defeat the official record set just 14 months ago in Teheran. Details. 18.02.2008 – St Petersburg 1909, New York 1924, New York 1927, Zurich 1953 – these tournaments are remembered not just for the players and the games, but for the magnificent tournament books that were written about them. Now two chess writers have set out to do the same for the 2005 World Championship in San Luis. The genesis of such a project is illustrated in our interview with the authors. 30.08.2009 – 29-year-old Iranian GM Morteza Mahjoob spent months preparing for the record attempt, which until then stood at 360 simultaneous games, set earlier this year by Bulgarian GM Kiril Georgiev. Mahjoob broke it by taking on 500 opponents and scoring 397 wins, 90 draws, 13 loses (= 88.4%). The effort lasted over 18 hours and was closely followed by the Iranian TV. Big illustrated report with videos. Guinness Simultaneous Chess World Record attempt – in Tehran! 10.08.2009 – The Swedish GM Ulf Andersson played 310 opponents in 1996, then Andrew Martin took on 321 in 2004. His record was broken in 2005 by Susan Polgar (350 opponents). Currently the record stands at 360, set earlier this year by Kiril Georgiev. Now the 29-year-old Iranian GM Morteza Mahjoob intends to get his name in the Guinness Book next Thursday by taking on 500 opponents. 25.02.2009 – After a month of training – mainly walking and saunas – Kiril Georgiev was ready to take the challenge and play a simultaneous exhibition against 360 opponents. 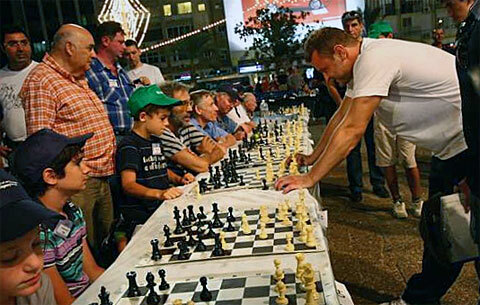 For every move the Bulgarian GM had to walk half a kilometer, and after six hours of play had made only eight moves. After 14 hours it was over, he had scored 88% with 284 wins, 70 draws and 6 losses. The record was broken! 03.08.2005 – She strode 9.1 miles, in high-tech sneakers, drinking orange juice. 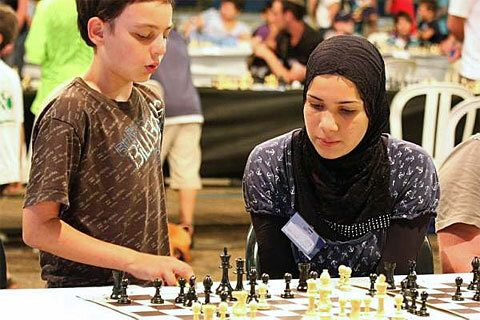 She faced 326 opponents simultaneously, scoring an unprecedented 99.03%. After breaking the Guinness Book's simul record Susan Polgar went on to break a few more, like 1,131 consecutive games played in one session. Here's the full illustrated report. 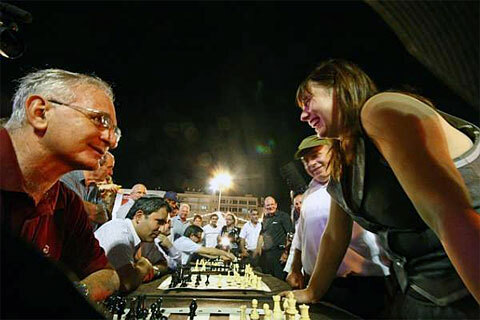 31.07.2005 – On August 1–2 there will be an attempt to break the record for the greatest number of chess games played simultaneously, as recorded by the Guinness Book of World Records. The simultaneous master is GM Susan Polgar, who will attempt to play 350 opponents at the same time, in a 24-hour period of time. Pictures of the preparation.